Bus from Singapore to Genting Highlands is one of the favourite routes for locals Singaporean because of the cooling weather, integrated entertainment resort, and casino in Genting Highlands. Though Genting outdoor theme park is temporarily closed for renovation and upgrading to the world’s first Twentieth Century Fox World, it does not stop Singaporeans to spend their vacation with their families in Genting Highlands. 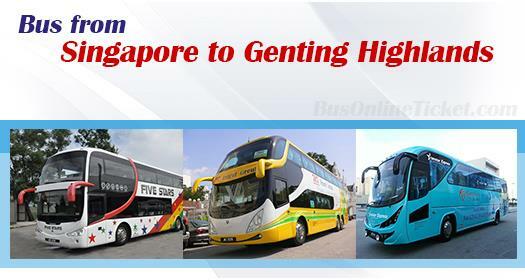 Taking a bus from Singapore to Genting Highlands is more convenient than taking a flight from Singapore to KL Airport then transfer shuttle bus to Genting Highlands. Coaches provide direct bus to Genting Highlands, with at least one washroom break along the journey. The bus fare for bus from Singapore to Genting Highlands ranges from SGD 25.00 to SGD 78.00, depending on the class of the coach. These buses generally depart from Golden Mile Complex, Beach Road, Boon Lay, and many other neighbourhood areas (usually bus stops) like Ang Mo Kio, Tampines, Chinatown, Jurong East, and many others. Arrival points for most buses will be at Genting Resort Hotel or First World Hotel, while KKKL also provides an arrival point at Awana Genting Hotel. The journey usually takes about 7 hours depending on traffic condition. Do take note that departures are divided into morning and night sessions with no afternoon or evening sessions. Passengers are advised to choose the correct departure time for them to avoid any disappointment. The journey of 7 hours sounds long but with fully reclining seats, air conditioning, personal entertainment system installed in Transtar Solitaire coaches and WTS CEO Platinum Cruiser, passengers may feel like their journey is shorter than the actual duration. Some other coaches like The One Travel, and KKKL provide standard VIP coaches with full reclining seats and air conditioning. Wifi is also provided in certain Transtar and Grassland Express coaches. Plan to spend a great holiday with your family in Genting Highlands? Book your bus to Genting Highlands ticket now online at BusOnlineTicket.com. All transactions in BusOnlineTicket.com are performed under secured environment and settled by credible payment gateway providers. Therefore, your credit card information is kept confidentially. Hassel free and secure booking environment in makes BusOnlineTicket.com to be the most popular online booking portal among the customer choice throughout these years.